Mobile technology has been changing consumer expectations for both e-commerce and brick-and-mortar retailers, making it more challenging to deliver satisfactory customer service. The 2017 IBM Consumer Experience Index (CEI) Study says only 3.4 percent of brands are delivering leading-edge customer experience, while 33.5 percent are delivering average service and 39.6 percent are lagging or falling behind today’s customer service trends. In an economy where customer experience is key to staying ahead of the competition, these numbers mean most companies need to improve their customer service to avoid losing sales to rivals. 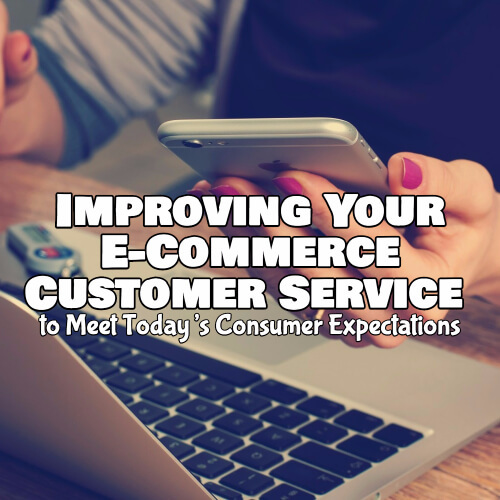 Here are three ways you can enhance your customer service to deliver a more satisfying e-commerce experience to your customers and outdistance your competition. To meet customer service expectations, IBM’s study recommends that companies should take more proactive steps to engage with customers. One way to do this is by delivering more personalized service. IBM’s research found that only 19 percent of brands deliver more than a basic level of personalized attention to customers. But 53 percent of customers say they want a totally personalized experience, which they feel is a fair exchange for the personal data they provide while shopping online, a Bazaarvoice survey found. To deliver more personalized service, stay on top of current shopping trends by using analytics tools and services from providers such as NPD Group, which uses point-of-sale data from 300,000 stores to follow and predict consumer trends in 20 industries. Use customer relationship management software to apply analytics to your own customers and extend personalized offers based on their behavior. Use social media channels to keep in touch with your customers and stay engaged. Customers also crave a more satisfying omni-channel shopping experience, IBM’s study found. Customers evaluate your brand based on their experience across all channels, rather than segmenting their experience by channel. If they have a bad experience on one channel, it negatively impacts their perception of your entire brand. This makes it imperative to deliver a smooth, integrated experience across all your channels. To achieve this, design your digital experience to appeal to customers from all channels, using technology such as responsive web design to make sure both mobile and desktop users enjoy a positive experience. If you have a physical location, make sure that your customers’ mobile shopping experience integrates with their physical shopping experience, using tactics such as beacon marketing to deliver digital offers in-store. IBM’s findings also recommend making more use of technology to add value to customers’ interactions with your e-commerce business. For instance, customers increasingly prefer self-service options to other options such as using the phone or email to talk to agents, with web self-service use increasing from 67 percent of consumers in 2012 to 76 percent in 2014, according to Forrester. Adding self-service options such as an online knowledge database can boost your customers’ satisfaction with their online experience. Live chat is another technology you can use to improve customer experience. Live chat delivers the highest satisfaction of any service channel, with 92 percent of customers reporting satisfaction after a live chat interaction, outperforming phone calls, web forms, email and social media, a Zendesk study found. Adding live chat can leave your customers more satisfied and keep your e-commerce business more profitable.